Rivers shape the landscape around them – the physical features are created by the power of water and the interaction with the underlying geology. This video shows animations of how processes create landforms and compares the drainage basins of the River Devon in Scotland with the River Cuckmere in Sussex. Rivers shape the landscape around them – the physical features are created by the power of water and the interaction with the underlying geology. This video shows animations of how features form and compares the management of the River Devon in Scotland with the River Cuckmere in Sussex. 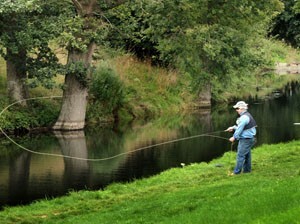 The main rivers in the National Park are the Itchen, Rother, Meon, Arun, Ouse, Cuckmere, and Adur. These rivers are considered to have a “flashy” nature which means that the water level rises quickly after rainfall and recede slowly. This is mainly due to the short, steep slopes in the water catchment area. The rivers and streams of the National Park create a range of wetland habitats that support a large number of different species. Wetland habitats found here include freshwater streams, marshes, lakes, reedbeds, ponds, canals, wet woodland and wet grassland. These habitats supporting a huge number of invertebrates, birds and also mammals such as water shrew, otter and water vole. The fish species in these rivers and streams include salmon, brown trout, bullhead, European eel and brook lamprey. The chalk streams of the National Park are very important for their biodiversity value – a recent survey by Nigel Holmes says that Sussex has some of the best examples of natural chalk stream habitats in the country. Many fish, amphibians and invertebrates thrive in the clear chalk streams of the Meon and Itchen in Hampshire where wild mammals that are difficult to spot such as otter and water vole may also be seen. Surface water is important for many of the streams including the River Rother which is also a strike river that follows the outcrop of Greensand. Most of the other valleys are dry, although some have winter streams or ‘bournes’ that flow because of the increasing water levels during winter months. Roads and villages are often found along these river valleys, while the higher areas tend to have more farms located there. The water catchments of these rivers drain south into the sea along the coast, passing through the towns such as Lewes, Newhaven and Arundel.